Create a room full of angelic charm and grace with this pair of beautiful angel wings. Finished in a rustic cream, these wings will make a great focal point in your living room. Make a statement with your wall decor and choose this stunning set of Large Cream wall mounted Angel Wings! 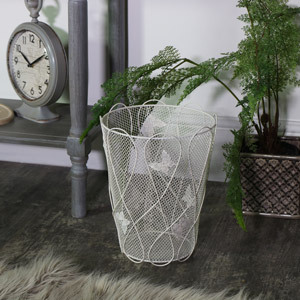 A fabulous vintage, shabby chic style piece of home decor that will help you create your own home heaven. With a slight distressed finish, these angel wings are fabulously detailed with a feathered look. Create a room full of angelic charm and grace with this pair of beautiful angel wings. Finished in a rustic cream, these wings will make a great focal point in your living room. Make a statement with your wall decor and choose this stunning set of Large Cream wall mounted Angel Wings! A fabulous vintage, shabby chic style piece of home decor that will help you create your own home heaven. With a slight distressed finish, these angel wings are fabulously detailed with a feathered look. Made from a cast resin with a cream slightly distressed painted finish, this item is also available in a gold colour! Just one of our extensive range of home accessories including wall art, plaques and frames, all of which would make great gift ideas for family friends and loved ones! This is a pair of large cream Angel Wings, made from cast resin and the mould is carved and ornate so that the feathers look realistic. They are painted cream and have a slightly distressed finish. These are wall mountable and we also have them in gold. They will make a statement in all sorts of settings, and their size is 41 cm x 19 cm (width x height).